Very enjoyable. Slightly cloudy refreshing with slight citrus after taste. This beer does not as advertised--need to improve the liquid. No attractive hop nose. Certainly not a "juice blanket." Very muddled malty flavors, with bittering hops noticeable at the end. If this was how juice tasted, juice sales would plummet. Would not recommend, especially at the price. Big malt sweetness combined with a huge punch of resinous pine. Not a juice bomb as advertised. Sticky, sugary and dank. There's a harsh bitterness here that's almost astringent. Been hearing good things about this beer's development and dialing-in over time, so got a single can to check out. Only had a couple other beers by LHBCo, which were pretty much unilaterally "fine," guess we'll see how Boomsauce is coming along these days. Pours a translucent, golden orange-leaning color with a finger of solid white foam, forming over a hazy surface. Lace seems a bit lazy, but the body itself is quite nice looking. Solid carbonation rising throughout, and a lot of hop sediment suspended within. Not bad looking at all. Quite nice actually. Nose is fairly interesting with notes of papaya, pine, fresh-squeezed grapefruit juice, pineapple and even some mint along with a slight malty/ethanol background tone. Digging the tiny bit of caramel malt I pick up here; keeps this from being boring and one-dimensional with muddled hop notes like some newer-school IPAs can be at times. Grapefruit and orange juice on the tongue with a big, bitter, pithy bite. Almost has a pulpy/fleshy quality to it, like biting into an orange slice. Very juicy flavor achieved without any fruit ingredients makes this pretty impressive and surprisingly enjoyable. There's a bit of spiciness here too, kind of spruce-y with light rye character maybe. A bit malty towards the middle of the palate but dries out for a bitter, rind-like wash of grapefruit and pine toward the end. Feel is rather soft and pillowy with low-ish natural carbonation and a big, bold finish. Medium-heavy bodied for the style but somehow doesn't even begin to approach syrupy. At 7.8%, this might drink a slight bit heavier than usual (for a medium-high ABV IPA/borderline DIPA), but it definitely seems to mean well, and it seems like they've mended most of the issues people had with earlier batches. Still not sure what's up with the attitude they had when starting up... I'll chalk it up to growing pains and move on, though, as it seems they're doing as well. 16oz can, purchase from my local packy. Packaged date of 12/22 (2015) on top of the 4-pack holder. Pours a nice healthy looking froth and sticks around right to the bottom of the glass. Nearly clear, some mild haze in the amber gold hue. Smells of fresh grated grapefruit and orange zest with faint suggestions of pine ... kiss of alcohol with a floral and pear-like aroma. Lots of hop flavor upfront, bitterness hits a little hard in the middle, and slightly juicy / earthy and warming in the back. Good malt base, a little bit of sweetness with some toasted bread within. Hop flavor sticks to the palate, pretty easy drinking for an 8% brew. Good use of hops, cleans up for the most part in the finish. Murky orange color. Has a full head with good lacing. Sweet malty taste, the hops just add bitterness and no juiciness. Mostly pine and floral notes. Its allright, but nothing I would seek out or pay $17 a 4-pack for. I guess I better start my own brewery. Was a 3.5 but tried on Tap 2/28 @ Doherty's Ale hours. Much improved! Citrusy and juicy. May actually purchase a 4 pack! Pour is cloudy copper with lots of beige head and a fair amount of large bubbles. Nose is heavy sweet malt and hop resin, overly bitter and just a hint of citrus. Flavor has a touch more citrus, overly sweet in the malt depot, tons of bitter resinous hops, grainy feel on a heavy body. Rough. Pint can poured into a tulip. Appearance: Mostly clear yellow/orange with a short white head. Aroma: Citrus, tropical fruit, candied sugar, pine. Taste: Follows the nose. Fruity, with a bitter finish. Lemon and grapefruit high up. Mouthfeel: Very drinkable at 8%. Overall: A solid IPA, but I'm not blown away. Not in the class of Lunch or Substance; more on a par with Narragansett's Town Beach or maybe Wachusett's Green Monsta. Definitely one of my favorite beer names. Hard to imagine a lot of people rebuying this guy at $16 a 4pk, not a terrible beer but definitely one thats lost on me and doesn't justify the price point. Edit: I'm going to retouch this one because it's been more than one batch I've tried and found a similar issue - diacetyl. The second this beer eclipses 45° the butter really starts to stand out. Upon emailing them the response I got was "people will drink this cold so we really don't care." Unacceptable in an ale at these levels. decent beer, but what is this "juice blanket" they speak of in the description? Just your standard hoppy/bitter/bitey IPA. don't think this one isn't good, just misleading based on the side of the can. Steal This Can I found to be juicier tasting, but thin mouthfeel since it's like a session. they either need to take the word Juicy off the can, or change the recipe. I will get Steal This Can over this beer every single time. UPDATED: definitely a recipe change since I last had it, rating amended. 4 canned 16 ozers for $14. 8% abv. More than I will pay normally. Poured into an Abandoned Brewery snifter. (Also abnormal for me as I like shaker pints.) Second time trying this beer, it was heavily hyped in the Boston area before it was brewed, sad to say that worked on me. Pours light and hazy, not a whole lotta aromatics goin' on. Looks good. Halfway through the glass, chewy, hoppy (I would call this a hop bomb), and a nice malt base. Kinda rough on the edges, but I don't mind that. This is a good beer with a great name. Maybe the Hobo was shooting towards a turbo-charged Ipswich IPA, which wouldn't be a bad idea. I don't know.... A new brewery, a new beer. Guessing it'll evolve, but the price will be a stumbling point for many in my opinion. A: The beer is a deep gold color with a thin off-white head that fades slowly and leaves a thin lace on the glass. S: The aroma contains floral hops, fruity citrus and caramelized malts. T: The taste starts out with a nice burst of piney hops bitterness that is quickly followed by a fruity citrus and caramel sweetness. The malt character is hearty but not too heavy and brings some balance. The after-taste is slightly sweet and slightly hoppy. O: Tasty, goes down easily, not too filling, good kick, good representation of style, it’s a decent IPA but there are several other beers in the style that I would pick first. A - Pours a lightly hazed gold with a two finger fluffy white head. Good amount of soapy lacing. S - Aroma is pineapple, tangerine and piney hops. T - The taste is orange peel. grapefruit, pineapple, bready malts and bitter piney hops. M - Medium body with medium carbonation. Creamy mouthfeel with a soft dry finish. O - Pretty decent DIPA. Drinks more like a west coast ipa than a NE style. Can shared by Todd, thanks I think. Murky deep golden color with a smallish off white head. Big caramel maltiness with plenty of grassy earthy hop aroma and flavor with some astringency. This is 90’s era home brewed beer at best, there is nothing clean or refined about this overpriced beer. Lord Hobo rocked this 4/21/16 batch for sure. Get your hands on it. It won't disappoint. 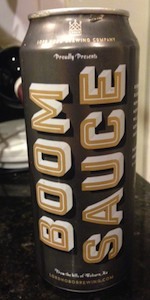 Never tried this beer before, but I have been spoiled with Tree House offerings for the past few weeks and here's what I can say about Boom Sauce: It is a melange of West Coast and East Coast IPAs. Great mouthfeel, slight bitterness on the end, a bit cloudy, but not clear enough to be a Chico strain fermentation without oats. It's just a great representation of an American IPA. Take a chance and taste this beer with a neutral mind and you'll see that Lord Hobo is onto something really exciting. There are no off flavors or flaws with this beer. It's creatively delicious and deserving of praise. Hats off on this one... Cheers! Not sure what hops are used, but I get a hint of creaminess along with tropical notes. A soft non-bitter finish reminiscent of the new east coast style. Glad this made it out to Colorado during GABF. Solid DIPA/IPA? From the Tap at the brewery into a snifter tasting glass. A= Copper, Burnt Orange. White Head with as expected lacing. S= No real smell to it other than a sweetness and maybe... MAYBE some citrus. No hop aroma here at all. T= caramel malt sweetness. maybe some fruitiness. M= Medium with good carbonation. bitter IPA finish. O= No hop aroma. No "Juice Blanket". Super pricey for a beer that doesn't do any of what the can says it does. Don't really recommend. 16 oz. can poured into a Spiegelau wheat glass. A- Hazy golden. Just off white head. Fairly dense and leaves some great lacing. Good retention. S- Fantastic aroma. So much hop. Big citrus and peel, pine, and juicy tropical aromas. T- Flavors a little muddled but still nice. All smell traits are there, with emphasis on pine and pith. M- Body is medium. Finish is bittersweet. A little long, a little astringent. Carbonation is a great level. O- Really nice. Aroma is fantastic, flavor a little less so. But this is a refreshing drinker for how big it is. Hazy golden with fading white head. Aroma of citrus, papaya, mango, pine, grass. Tastes of citrus, papaya, mango, pine, grass, mint, and medium bitterness. Medium bodied with medium carbonation. Slick mouthfeel. Hmmm, I tasted this beer with a few of my friends and the comments ranged from "this is good" to "this is ok, but a bit harsh" to "this would be a good beer to cook with." Personally, I was not a huge fan, and the finish had too much bite. Pours an orange barely see throw th with a 1 finger head on draft. Aroma- peach, pineapple pine zesty. Orange, lemon. Taste- piney, orange, lemon, medium bitterness. Sap. Mouthfeel is pretty smooth and velvety. Overall- fairly classic west coast taste to this double.